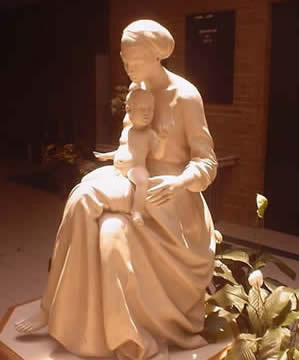 The figure of the Madonna and Child, located in narthex of St. Paul’s Sanctuary, was dedicated October 9, 1982. The statue is of the seated Virgin with the Christ Child in her lap. It is cast in polyester with carracim dust and is life-size. This work was commissioned as a memorial statue for Kevin Keiner with donations for that purpose from members of St. Paul’s. Three entries were submitted from local artists and the commission was awarded to John Paul Harris of Asheboro NC. Mr. Harris spent two years at the Pennsylvania Academy of Fine Arts and has an MFA from the University of North Carolina at Greensboro. His works have been exhibited throughout the State of North Carolina. This statue is a beautiful reminder of Mary’s love for her Son and for all of us.